Hey gang! Im new here. Done many other DIY projects, including a few hardwood w/ poly shelving projects but never touched hardwood flooring. My wife and I just bought a townhouse and it has these older oak floors in it (about 1000 sq ft). 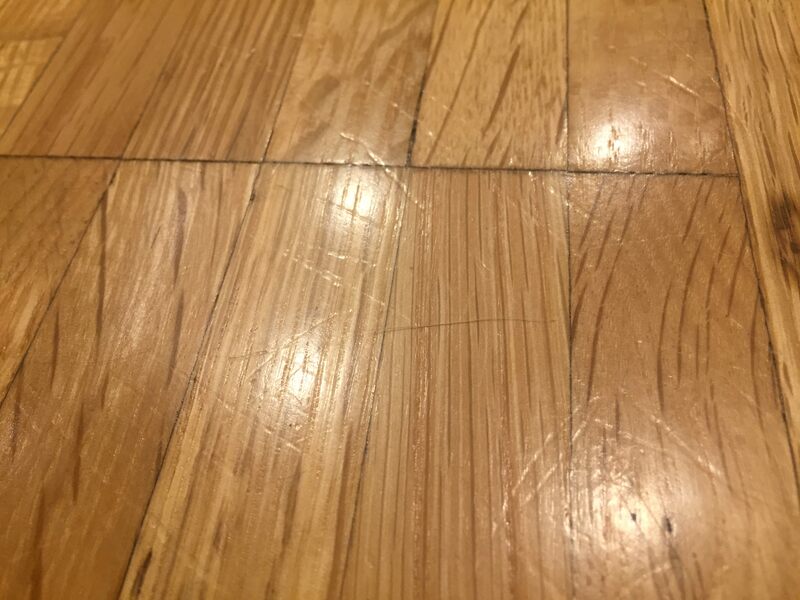 There are patches where there appears to be dog scratches in the flooring. Most all of them appear to be through the poly itself. Could some of you kind folks help point me in the direction I should take on this? I was thinking of first trying to screen the floor and recoat with water based poly. Am i wasting my time? Should i just start out with a drum sander and redo everything? I totally understand I should not just do the sections, but rather i should do the whole floor... Also, this appears to be a semi gloss finish. I wouldnt mind redoing this same finish.. Thoughts? Re-coating your floors is a practical solution. After the floors are cleaned and still wet, this will be the color that another oat of finish would show. The worn spots will still show scratches in the reflection, but the wood will be protected from wear and stains, and be easy to clean as it becomes smooth. This is a lot of work in preparation, so I think you should plan on applying two coats of finish. It's almost as much work as sanding to bare wood and starting over, but most of the floor, or at least around the walls have practically no wear, so you are just building a finish up where it has worn off. Thanks Pete. I appreciate the feedback!